Omaha, Nebraska May 15, 1940 Dear SB: To-day's mail brought a letter from Mr. Baum addressed to "Nile Kinnick, 1524 Hamilton Street". We felt that it must be for you, but that you would send it back if we should forward it to you first - so opened it, to find it a copy of one doubtless sent to you at Iowa City, What a different letter from his usual style. It shows that he can write r normal business letter, and lends strength to by belief that his other efforts have been natural selling "come-ons". 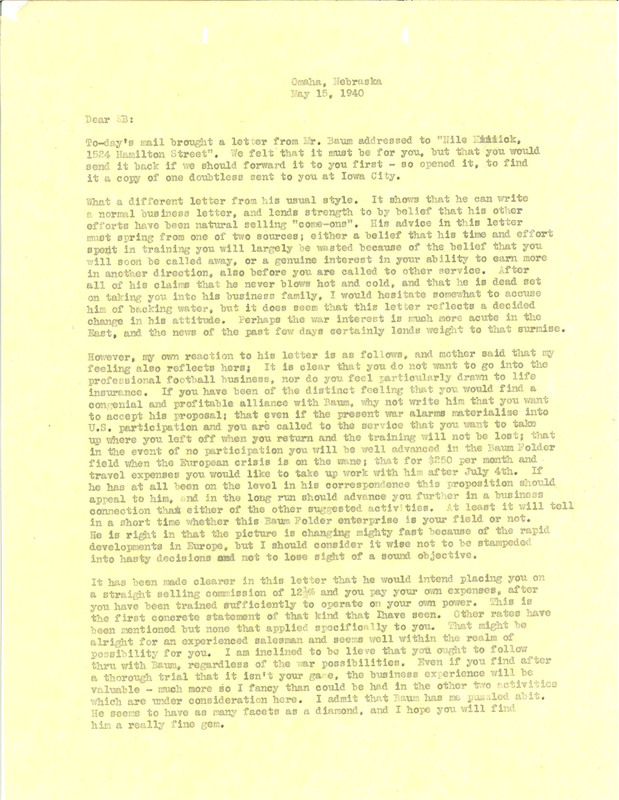 His advice in this letter must spring from one of two sources; either a belief that his time and effort spent in training you will largely be wasted because of the belief that you will soon be called away, or a genuine interest in your ability to earn more in another direction, also before you are called to other service. After all of his claims that he never blows hot and cold, and that lie is dead set on taking you into his business family, I would hesitate somewhat to accuse him of backing water, but it does seem that this letter reflects a decided change in his attitude. Perhaps the war interest is much more acute in the East, and the news of the past few days certainly lends weight to that surmise. However, my own reaction to his letter is as follows, and mother said that my feeling also reflects hers; It is clear that you do not want to go into the professional football business, nor do you feel particularly drawn to life insurance. If you have been of the distinct feeling that you would find a congenial and profitable alliance with Baum, why not write him that you want to accept his proposal; that even if the present war alarms materialize into U.S. participation and you are called to the service that you want to take up where you left off when you return and the training will not be lost; that in the event of no participation you will be well advanced in the Baum Folder field when the European crisis is on the wane; that for $250 per month and travel expenses you would like to take up work with him after July 4th. If he has at all been on the level in his correspondence this proposition should appeal to him, and in the long run should advance you further in a business connection than either of the other suggested activities. At least it will tell in a short time whether this Baum Folder enterprise is your field or not. He is right in that the picture is changing mighty fast because of the rapid developments in Europe, but I should consider it wise not to be stampeded into hasty decisions and not to lose sight of a sound objective. It has been made clearer in this letter that he would intend placing you on a straight selling commission of 12 1/2% and you pay your own expenses, after you have been trained sufficiently to operate on your owm power. This is the first concrete statement of that kind that Ihave seen. Other rates have been mentioned but none that applied specifically to you. That might he alright for an experienced salesman and seen well within the realm of possibility for you. I am inclined to be lieve that you ought to follow thru with Baum, regardless of the war possibilities. Even if you find after a thorough trial that it isn't your game, the business experience will be valuable - much more so I fancy than could be had in the other two activities which are under consideration here. I admit that Baum has me puzzled abit. He seems to have as many facets as a diamond, and I hope you will find him a really fine gem.